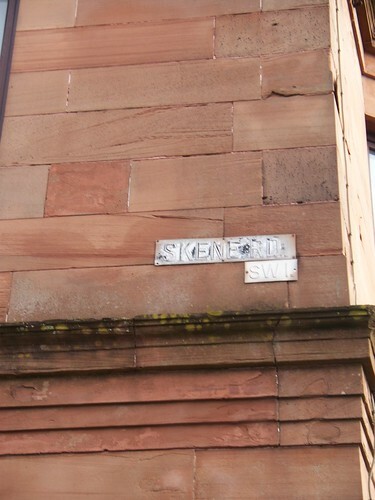 I've had a search round the forums and haven't seen anything, but has anyone ever tried photographing all the old postcode signs around Glasgow? There's an SW1 sign on the corner of my building (photo to come as soon as I get new batteries!). I think that sign was the border of SW1 when the original codes were introduced in the 1920s, as Helen St Police Station (the next surviving building down the road - the ones in the park are G41) is G52 and the houses between here and there were built in the late 30s, and destroyed last year. I don't remember ever seeing any others, but thought that would make the hunt more entertaining! Here's a project that may interest anyone in the area of the Govan or Whiteinch. Several Glasgow School of Art students have been down beneath the water of the Clyde over the past week installing a project that celebrates the Clyde tunnel's pedestrian and cycle routes, which remain dry thanks to the engineering feat of the construction. The theme is sub-aquatic and hopefully people will find 'enchantment under the river'. Think it sounds fishy? Go and see the project for yourself and be immersed in it. The installation is situated roughly 100 meters within the North side of the tunnel and will be placed there indefinitely, but check it out soon, before the currents sweep it away. The tunnel's controlled entry and fully camera laden now, isn't it? Is it? I'll need to go and have a look sometime soon. Anyone seen all the paper mobiles and stuff in the pedestrian underpass at Cowcaddens Station, btw? Not the expensively-refurbed-and-regularly-vandalised one, the one on the other side of the station. It's definitely gated at both ends with buzzer entry Josef and I'm sure someone said it has been imbibed with surveillance cameras now too. Doorstop wrote: The tunnel's controlled entry and fully camera laden now, isn't it? How about an interactive map (if there's someone on the site that could code such things) with photos and info from the forums (fora!) available by clicking? Would be a great way to get lots of relevant info in one place, easily accessible, no? We Built them we drove them. Trains, eh ? Remember looking through half a dozen boxes of lantern slides of steam choof choofs once. This was maybe thirty years ago. Slides came from the British Rail offices in Glasgow; Buchanan St ? And I was lead to believe there was a walk in cupboard of slides, and what I got to see was but a small sample. Would be good to know where these are now, and whether anyone has digitised them. Don't remember for sure, but I'd bet such slides would also be a treasure trove for those wanting pictures of old stations etc ? Which leads to second idea... lantern slides in general. Would be good to have these digitised and see what records they hold. Like steam engines and ships of all sorts. Or even record the local lanterns themselves ? I've got a magic lantern in my mum's attic, back in Cumbernauld. It was made by Lizars (a good Glasgow brand) and converted to electricity - via a fiercesome 500W bulb - many years ago. I'm based in Melbourne currently and couldn't get the weight of the lantern and slides back after my dad died. But, only just occurred to me, if I could digitise the glass slides, I wouldn't need to shift the lantern. Has anyone done that; digitised the standard 3.25/3.5 inch double glass slides ? Do I need a "transparency cover" for my scanner - whatever that is ? Third idea. I know some of the slides that I have (other than shots of paddle steamers going doon the watter) include stories told at temperance society meetings, ect, like at the International Order of Rechabites. Not many of them on this forum I bet ! So, what of the social history of Glasgow's own social and religious dissenters - like the Rechabites, Band o Hope, Seamen's Mission, Tabernacle ? Do any of these organsiations / meeting places / head offices still exist ? Anyone got photies ? I was staying at the Premier Inn Glasgow Zoo this weekend and talking to the manager he told me that you could access the old Calderpark Zoo site (The gates are just beyond the hotel) and that "It was quite spooky with all the old cages and enclosures overgrown and empty". I use a wheelcahr myself so although the gate was not locked it would have been impossible to get in. A wonderful project to record this before they build houses on it. It's already been well covered, TB.